Trutovsky Konstantin Aleksandrovich famous Russian painter and graphic artist. This work is made in a simple folk style, which the artist often liked to use. The author uses a simple arrangement of figures close up against the background of the landscape. The artist depicted on the canvas simple working peasants. Images of people are made quite naturally, and the colors are chosen exactly as live. The plot of the picture is colorful and interesting. The author skillfully depicted the summer sunny day in the village, the clear blue sky tightens us and beckons with its blue. The sun shines brightly and warmly, and the soul becomes so calm and quiet. A small river flows along the grove, green grass lies beautifully above the river, the green spreads around like a carpet. Everything around is green and beautiful, quiet and calm, the weather just stood out that day. In addition to the beautiful nature, we still see four people in the picture. 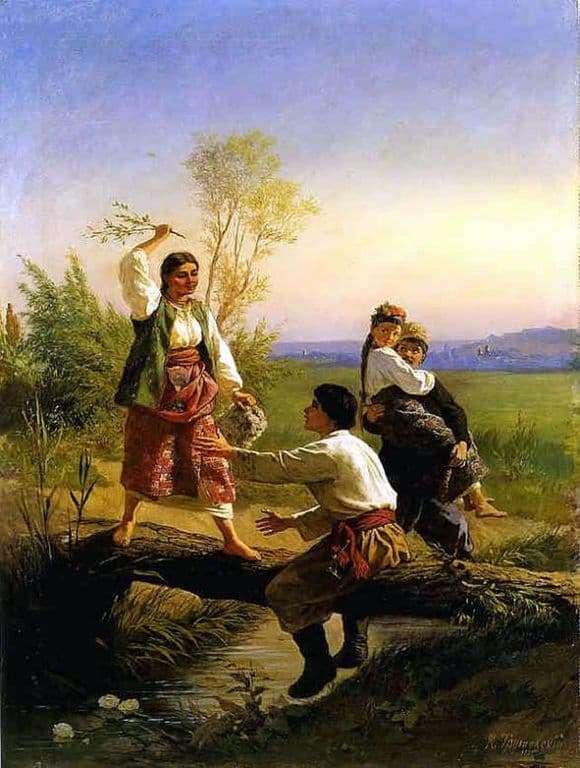 Young peasants, a girl and a guy, carefree and rejoicing in their lives, were quietly resting in nature. On the canvas, we see a young man sitting on a bar, and suddenly, a woman suddenly comes flying with a club in her hand, she is serious and is very much worried about something. A woman takes off his hat from a guy and swings at him with all his might. But the guy as if with a questioning look asks her why??? Here we can only guess that the woman is the mother of the girl, and the man seized the young lady in the arms of her father. And immediately it becomes clear to us that these two young people love each other. They decided to run away from everyone far away, so that at least a little bit to be together, the young people wanted to spend this beautiful sunny day only together, without extra eyes. Around the silence, everything is so calm and charming, their souls are circling over the sky rejoicing that they are together that they love. And then all of a sudden their rest is broken by her parents, who have already searched their daughter. They take her home, and the young idyll ends there. But still, apart from all the prohibitions, the girl and the boy love each other very much. And this picture shows us how well it is to love someone and that you are loved and that beauty and love will save the world.